August 10, 2010 marked the 30 day point since Las Vegas Metropolitan Police gunned down Erik Scott at the front entrance of the Summerlin Costco. In order to bring continued awareness to the incident and honor Erik, his family and friends coordinated simultaneous candlelight vigils at both the Summerlin Costco and the Costco in Erik’s hometown of Lancaster, CA. 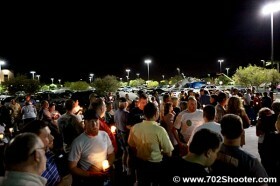 The Summerlin gathering included roughly 125 people, some of which knew Erik but many who did not. The crowd represented a mix of people from all walks of life. Men, women, and children as well as off duty and retired police and military, some of which were the most outspoken of the group. About 1/5 of the attendees chose to display their support by open carrying their own weapons, which is a Constitutionally protected right still honored by 42 of the 50 “United” States. Although some of the local media outlets are reporting differently, there was a lot of anger and resentment towards the LVMPD. At any given time you could hear between 2 and 5 conversations that were focused on this very topic. One who was not familiar with the situation might have confused this gathering with a group of conspiracy theorists. The circumstances surrounding Erik’s shooting are devastatingly unclear. The accounts from the Police Officers involved seem to vary greatly from those offered by many eye witnesses and the only “reliable” proof exists in the video system that Costco claims had a glitch. One of Erik’s best friends, Mike Pusateri, isn’t buying this story. Pusateri tells us that Costco has “…a redundant video system. They back their video and audio data offsite.” The lack of available video contributes greatly to the public doubts of the accuracy of the LVMPD’s statements. Erik Scott had a Concealed Carry Weapon permit (CCW) and was in possession of two guns at the time of his shooting. While Police claim Scott drew one of his firearms, in a threatening manner, multiple witnesses say differently. Moving beyond the first gun, the second gun was discovered by medical staff after Erik had been removed from the Costco property. Those who are familiar with Police procedures find this to be disturbing as well. The common question of “If the officers had done their job properly then why did they not find the second weapon?” casts even more doubt about what really happened. In an ongoing search for the truth, Erik’s family and friends have banded together. They have created a few Facebook Pages as well as a website where people can go to find and share information ErikBScott.com contains links to the Facebook account, photos, and discussion forums along with a way to make donations and contact the family. To further spread the word, there are currently 7 billboards in the Las Vegas area and 16 more going up within the next week or so. A plane towing a banner which read “Vegas Police cover up? R. I. P. Erik B Scott.com” was flown over Huntington Beach, CA during the U.S. Open of Surfing on Sunday August 8th, 2010. I believe the majority of people in Las Vegas do not think what happened to Erik Scott should have every happened. Furthermore, a lot of us feel that if it happened to Erik, it can happen to anyone. The truth needs to be told. Erik’s family deserves answers! In my personal opinion, this whole incident and the continuation of the way Metro and Sheriff Gillespie have handled it have made me lose faith in the honesty and integrity of our Metro Police Department. My sincere hope is that this causes Sheriff Gillespie to not be re-elected again for next term. I think we have heard enough with him telling us to be patient and then postponing the coroner’s inquest indefinitely. Whatever faith we may have had in the system is now gone. 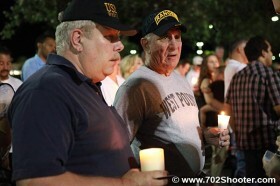 You did a great job of the pictures, video, and write-up of the Candle Light Vigil for Erik Scott. I cannot say I was glad to go to Erick Scott’s vigil. What I can say is I am satisfied with the coverage of this story across the valley. I didn’t know it even reached California by plane. I will say thank you for the coverage and I am hoping there will be peace for those who have known and loved him.